For the novel by Thornton Wilder, see The Bridge of San Luis Rey. Today, Mission San Luis Rey de Francia is well maintained. This Mission is architecturally distinctive due to the combination of Spanish Renaissance, Moorish—Mudéjar, and Spanish Colonial architecture styles. Spanish was used instead for the mission founded further north in 1776. The area became a standard camping stop on the road connecting the missions, until the mission establishment 29 years later. The original name La Misión de San Luis, Rey de Francia (The Mission of Saint Louis, King of France) was named for King Louis IX of France. Its 'nickname' was "King of the Missions" It was founded by padre Fermín Lasuén on June 12, 1798, the eighteenth of the twenty-one Spanish missions built in the Alta California Province of the Viceroyalty of New Spain. At its prime, Mission San Luis Rey's structures and services compound covered almost 950,400 acres (384,600 ha), making it one of the largest of the missions, along with its surrounding agricultural land. Two outposts were built in support of Mission San Luis Rey and placed under its supervision: San Antonio de Pala Asistencia in 1816 and Las Flores Estancia in 1823. 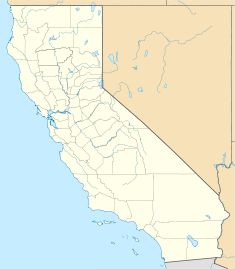 The first Peruvian Pepper Tree (Schinus molle) in California was planted here in 1830, now iconic, widely planted, and renamed the California Pepper tree in the state. After the Mexican secularization act of 1833 much of Mission San Luis Rey de Francia land was sold off. During the Mexican–American War in Alta California (1846–1847), the Mission was utilized as a military outpost by the United States Army. In July 1847, U.S. military governor of California Richard Barnes Mason created an Indian sub-agency at Mission San Luis Rey, and his men took charge of the mission property in August, appointing Jesse Hunter from the recently arrived Mormon Battalion as sub-agent. Battalion guide Jean Baptiste Charbonneau, the Native American Shoshone child of Sacagawea who had traveled with the Lewis and Clark Expedition forty years earlier, was appointed by Mason as the Alcalde "within the District of San Diego, at or near San Luis Rey" in November 1847. Charbonneau resigned from the post in August, 1848, claiming that "because of his Indian heritage others thought him biased when problems arose between the Indians and the other inhabitants of the district." 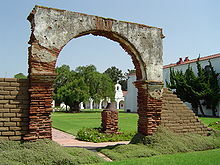 The courtyard of Mission San Luis Rey de Francia, with the first Peruvian Pepper Tree (Schinus molle) planted in California in 1830, visible behind the arch. With secularization of the mission in 1834, no religious services were held and the Luiseño were left behind by the fleeing Franciscan padres. The Mission's religious services restarted in 1893, when two Mexican priests were given permission to restore the Mission as a Franciscan college. Father Joseph O'Keefe was assigned as an interpreter for the monks. It was he who began to restore the old Mission in 1895. The cuadrángulo (quadrangle) and church were completed in 1905. San Luis Rey College was opened as a seminary in 1950, but closed in 1969. Episodes 2, 3, 4 and 12 of the Disney-produced Zorro TV series include scenes filmed in 1957 at San Luis Rey, which doubled for the Mission of San Gabriel; Disney added a skull and crossbones to the cemetery entrance. In 1998, Sir Gilbert Levine led members of the Los Angeles Philharmonic and, with the special permission of Pope John Paul II, the ancient Cappella Giulia Choir of St. Peter's Basilica, in a series of concerts to commemorate the 200th anniversary of the founding of the mission. These festival concerts constituted the first-ever visit of this 500-year-old choir to the Western Hemisphere. The concerts were broadcast on NPR's Performance Today. In February 2013, the seismic retrofitting was completed. Today, Mission San Luis Rey de Francia is a working mission, cared for by the people who belong to the parish, with ongoing restoration projects. Mission San Luis Rey has a Museum, Visitors' Center, gardens with the historic Pepper Tree, and the original small cemetery. 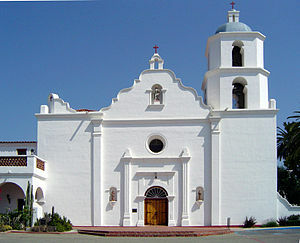 Mission San Luis Rey de Francia as it appeared in 1986. In 1841, French explorer Eugene Duflot de Mofras produced a sketch of the Mission that depicted a second belfry, thereby supporting the theory that two bell towers were planned, but never completed; the lone tower was also used as a lookout post. USNS Mission San Luis Rey (AO-128) – a Buenaventura Class fleet oiler launched during World War II. ^ Engelhardt, San Diego Mission, pp. v, 228 "The military district of San Diego embraced the Missions of San Diego, San Luis Rey, San Juan Capistrano, and San Gabriel." ^ Krell, p. 315: as of December 31, 1832; information adapted from Engelhardt's Missions and Missionaries of California. Mission San Luis Rey was by far the most dominant of the Alta California missions at this time in terms of the number of neophytes attached to it. ^ Johnson, et al. : "In contrast to baptismal patterns documented at missions in much of the rest of California, Mission San Luis Rey appears to have coexisted with nearby native communities for a much longer period of time without fully absorbing their populations...This may be the result of a conscious decision by the head missionary at Mission San Luis Rey, Fr. Antonio Peyri, to permit a certain number of baptized Luiseños to remain living apart from the mission with their unconverted relatives at their rancherías [villages]. The native communities in this way gradually became converted into mission ranchos at Santa Margarita, Las Flores, Las Pulgas, San Jacinto, Temecula, Pala, etc." ^ a b "San Luis Rey Mission Church". National Historic Landmark Quicklinks. National Park Service. Archived from the original on 3 April 2012. Retrieved 22 March 2012. ^ "San Luis Rey Mission Church". National Historic Landmarks Program. National Park Service. Archived from NHL Details the original Check |url= value (help) on 3 April 2012. Retrieved 26 February 2013. ^ "San Luis Key Mission Church" (pdf). Photographs. National Park Service. Retrieved 22 May 2012. ^ Bolton, Herbert E. (1927). Fray Juan Crespi: Missionary Explorer on the Pacific Coast, 1769-1774. HathiTrust Digital Library. p. 131. Retrieved April 1, 2014. ^ Reading, Mrs. James (June 1965). "Jean Baptiste Charbonneau: The Wind River Scout". The Journal of San Diego History. 11 (2). ^ Neuman, Charlie (6 February 2013). "Mission San Luis Rey's Earthquake Retrofit". San Diego Union Tribune. Retrieved 6 February 2013. ^ "Old Mission San Luis Rey de Francia". Old Mission San Luis Rey. 2013. Retrieved 26 February 2013. Johnson, John; Crawford, Dinah; O'Neil, Stephen (1998). "The Ethnohistoric Basis for Cultural Affiliation in the Camp Pendleton Marine Base Area: Contributions to Luiseno and Juaneno Ethnohistory Based on Mission Register Research". SAIC, Santa Barbara, CA. Lightfoot, Kent G. (2004). Indians, Missionaries, and Merchants: The Legacy of Colonial Encounters on the California Frontiers. University of California Press, Berkeley, CA. ISBN 0-520-20824-2. Wikimedia Commons has media related to Mission San Luis Rey de Francia. Calisphere – California Digital Library: Early photographs, sketches, and land surveys of Mission San Luis Rey de Francia. Howser, Huell (December 8, 2000). "California Missions (101)". California Missions. Chapman University Huell Howser Archive. This page was last edited on 24 April 2019, at 00:55 (UTC).